It’s been a while since I have posted anything. Being wrapped up in my senior year at Webster University has kept me occupied. Rather than explaining my story I’ll jump right into some events that have been happening. Starting with the most recent, I’ll give you an incredible new location to continue on your vinyl journey. Nestled amongst the hustle and grind of what is known to most as “The Grove” here in Saint louis, lives a beautiful record store perfectly named The Music Record Shop. 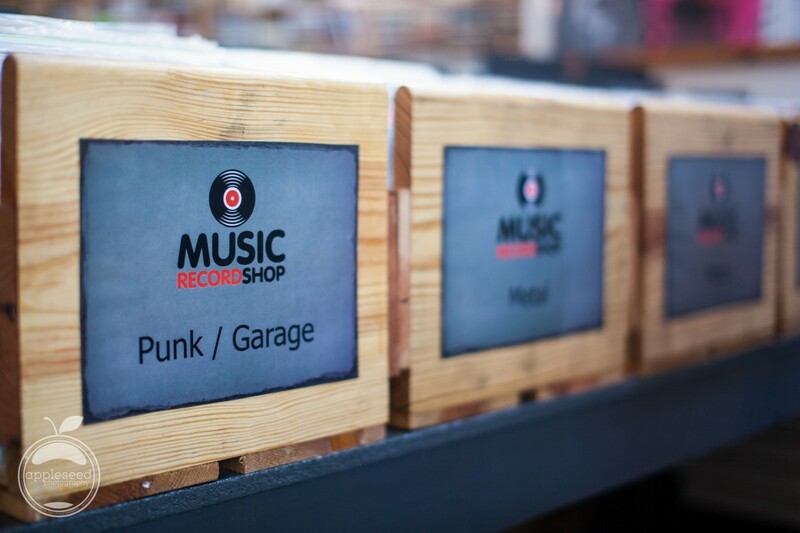 Located right next to The Groves newest music venue,The Ready Room, The Music Record Shop marks its territory. The Shop is packed front to back with a great selection of vinyl, and on this day I visited there were two live musical performances lined up to draw in a crowd. The first band, I was turned on to and able to shoot some video for a few weeks ago, is Music Embryo. There sound is beautiful, I’m not sure how else to put it. There is so much talent enthralled in this band that it births great music. The band is lead on guitar by Dan Turnbaugh and backed by some really great musicians on keys, drums, and a belly full of bass. Before they start the jam I am greeted with a tasty drink and introduced to the Shop’s crew. With a cold one in hand I meet Daniel Sexauer who has such a familiar face but can’t put a button on it, and Mark Carter who is delightful to chat with. After a few words I turn and say what’s up to Dan Turnbaugh and find a nice spot to take some shots while they entertain. Once the music ensues the crowds attention is greeted with the sounds of good spirit. A few in the crowd enjoy the music while thumbing through the stores selection of vinyl. I drink my drink and enjoy as well. The next act lined up to play is the Cody James Project, sadly I was not able to stick around as school was tightening the collar around my neck. With candy still on display from Halloween, I grab a Tootsie pop and roll out. It was such a great experience and just what I needed to get the juices flowing for a long session in the studio. Be sure to visit the Music Record Shop located at 4191A Manchester Avenue St. Louis, MO 63110, and go take a listen to Music Embryo and The Cody James Project. I will end this post now and be back with some other events I have attended this year.